Douglas Channel is a 100 km long fjord located south of the municipality of Kitimat, in northwest British Columbia. The Hartley Bay map area covers the southern portion of Douglas Channel where it meets Wright Sound and Verney Passage. The area also covers Promise Island, the southwest portion of Gribbell Island, southwest Hawkesbury Island, and a stretch of the western shore of Douglas Channel (mainland) that extends over about 17 km southward from Kiskosh Inlet. Mapping of surficial sediments, compilation of landslide deposits, and preliminary interpretation of bedrock types up to height of land were primarily carried out using British Columbia airphotos dated from 2001, 2003, and 2007 ranging in scales from 1:15 000 to 1:25 000. Older, field-based mapping by the authors in some isolated parts of the study area was incorporated into this mapping, complemented with additional, reconnaissance-level field observation in 2015 and 2016. The photograph (Figure 1) taken from the southwest side of Hawkesbury Island, looking north, shows the surface expression of deep-seated gravitational slope deformation features (DSGSD; black arrows) also called tension cracks or "sackungen". 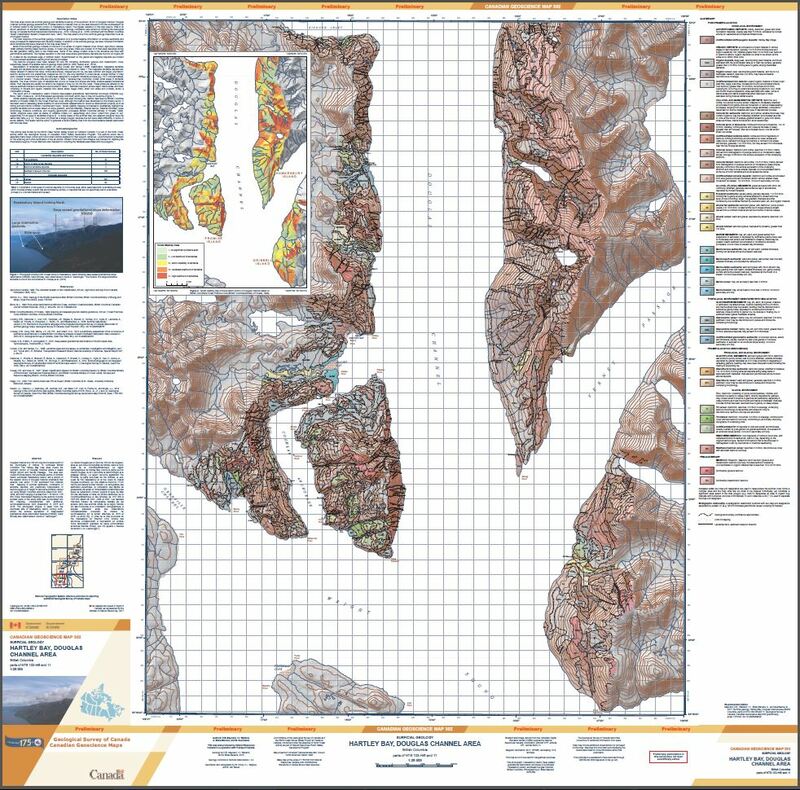 This is one of six surficial geology an d landslide inventory maps that cover Douglas Channel. Douglas Channel is a 100-km long fjord located south of the municipality of Kitimat, in NW British Columbia. The purpose is to provide baseline geoscience information on surface sediments and landslide hazard to decision-makers.